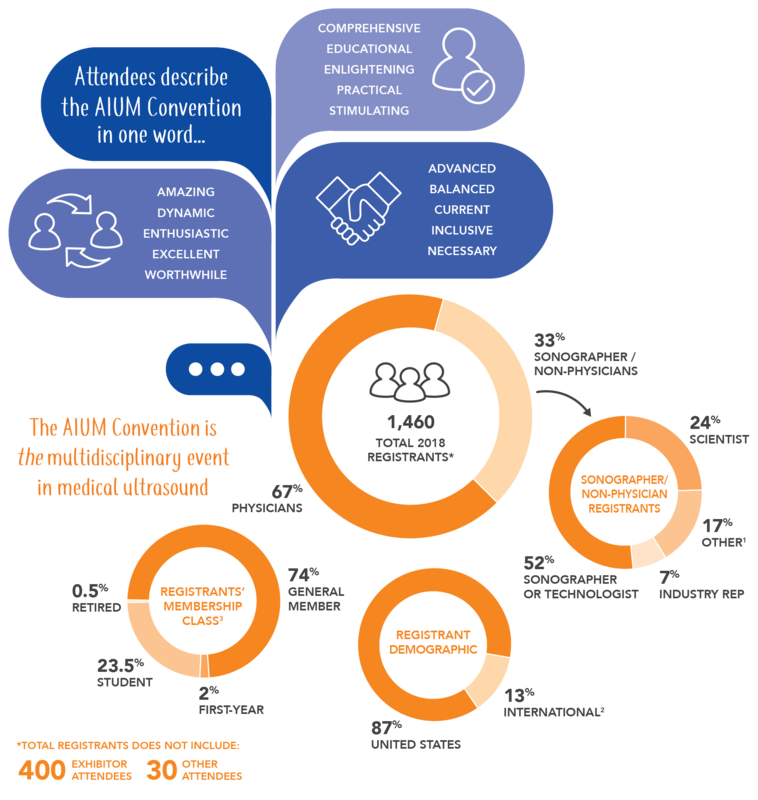 Why Should You Attend the 2019 AIUM Convention? The AIUM Convention is the only one of its kind, bringing together a multidisciplinary audience from over 20 specialities in ultrasound. Our meeting is designed to give you 4 full days of access to interactive sessions on patient care, best practices in ultrasound, training, and technical development. With over 150 session offerings, you are sure to find something of interest to you! See the General Info page for more information. Based on 2018 AIUM Convention data. 1 Other categories of non-physician attendees include: Nurse, Physical Therapist, and Physician Assistant. 2 International attendees were domiciled in: Argentina, Australia, Bangladesh, Belgium, Botswana, Brazil, Canada, Chile, China, Denmark, France, Germany, Greece, Grenada, Hong Kong, India, Ireland, Israel, Italy, Japan, South Korea, Lebanon, Mexico, Netherlands, New Zealand, Nicaragua, Norway, Pakistan, Peru, Philippine Islands, Poland, Saudi Arabia, Spain, Sudan, Sweden, Switzerland, Taiwan, Turkey, and United Kingdom.